The only German kite and surf school in Tarifa with its very own beach house to attend our clients and OPEN ALL YEAR! Also many other meeting points in town for your comfort, as we also offer free transfers to the beach. We are a proud founding member of the AEKET (Association of Official Kiteschools of Tarifa) as from its creation in 2015. Spanish FAV (Spanish National Federation) as required by law for all official kiteschools in Tarifa. 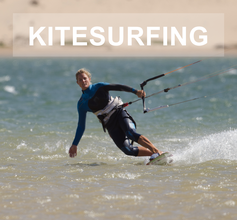 Our aim is to provide all the tools to learn kitesurfing, in a safe and responsible manner. You will get in the water with confidence and continue to kitesurf independently. COMES AS A STRANGER, LEAVE AS A FRIEND. You want to learn kitesurf or improve it? Our private lessons are the fastest and most effective way to get you there, completely personalized and adapted to your needs and requirements. A must do, at least once in your lifetime: a Kite Camp! 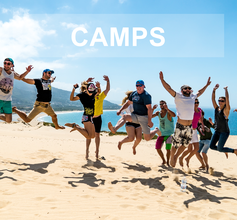 We offer amazing kite and surf camps in Tarifa or Morocco! You will live an unforgettable holiday with unlimited hours of kitesurfing and surfing. Get to know why so many people choose to combine kitesurfing and yoga for their holidays or getaway, and even keep applying it in their daily lives. 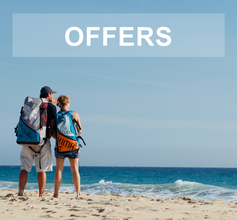 Great offers as well as tailored trips, making your vacation one of a kind. Many years organizing all types of events, as managing large groups, whether there are incentives, corporate events or private parties. Tarifa and its surrounding, offers the perfect location for your MICE, DMC or group gathering. 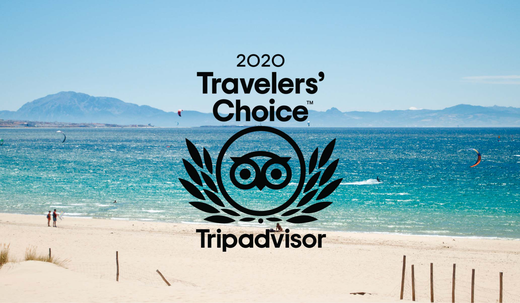 What to expect on your kitesurfing holidays in Tarifa? So you have decided to kitesurf in Andalusia? What a great choice! You will enjoy the pristine waters and lush nature of Tarifa and its surroundings. Relax on the golden sandy beaches of the Costa de la Luz and discover the famous nightlife of Tarifa town and famous chiringuitos! Other activities like YOGA, wakeboarding, horse riding, stand-up paddle, surfing and enjoying great barbecues, awaits you. 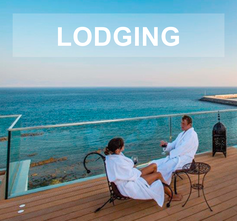 We will be happy to assist you in organizing your perfect holidays or getaway! We are specialists in tailor made trips! 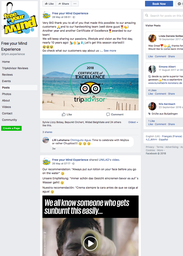 We guarantee fair prices, a friendly and professional team and a breathtaking and varied holiday in Tarifa with a lot of sports and a lot of nightlife. Whether you come on your own, with your partner, family, or with a group of friends, you will be warmly welcome and by no means alone on the road. We look forward to your visit and try to make you discover you the thrilling passion for kitesurfing. Your Free your Mind kiteboarding team. No suitable conditions for kitesurfing? Discover all our channels and great content! 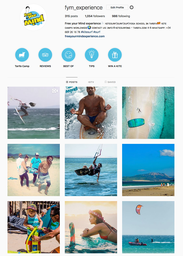 Our Facebook page will give you all the information you need regarding kitesurf, our offers, classes, and much more! Like our page and follow great kitesurfing and surfing content, tips and even win a kite ;)! Our great Instagram feed will keep you entertained, informed and inspired! Videos, pictures and much more await. Daily stories and live sessions! Have you seen we offer a kite too? 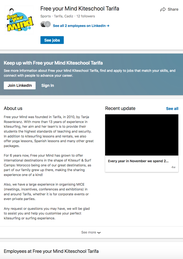 Get all our pro info also available on LinkedIn, as well as offers, camps and much more. If you are a professional of our industry, as travel, kitesurf, hotels or anything related to our world, we welcome all collaborations. If you are also a twitter fan, just follow us and get awesome content and info on kitesurfing, our trips, camps and much more! Not a twitter fan? 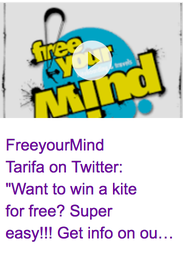 Get one of the previous channels then and follow Free your Mind!